Meghan crossed the street in downtown San Diego, bouquet in hand, the trail of her dress in the other. Tucked behind the corner of a beautiful loft building, Chad waited eagerly to feel the touch of Meghan’s hand. She tapped his shoulder and Chad turned around to see his gorgeous bride smiling in the afternoon sun. One hour later, Meghan + Chad were cheering on a sprawling rooftop with their 20 bridesmaids + groomsmen (Truly cocktails in hand of course) overlooking Padres stadium. Everyone was so pumped to see these babes say “I-do”. Meghan + Chad exchanged vows a few blocks down at the stunning Moniker Warehouse, even their pup Tessa was there to watch! 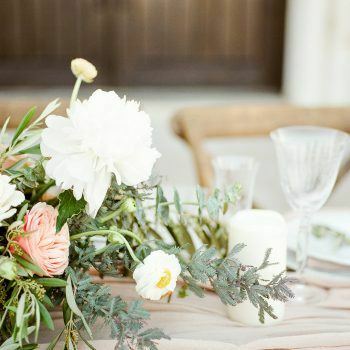 The room was filled with modern and bohemian lights, natural green florals, and rustic details. Once they officially tied the knot, their family and friends joined them in fireball shots and fresh stone oven pizza!